Communication-based Train Control Solution « Global Market Insights, Inc. The growing prominence of IoT & its intense adoption in the railways prompted by government initiatives are driving railway management system market lately. The increased IoT adoption rate can be aptly credited to the technology’s ability of providing rail operators with precise information on the train’s location with regards to other trains in its vicinity, facilitating increased passenger safety. The system is also capable of regulating the locomotive’s speed automatically based upon the real-time information delivered by the IoT system, significantly reducing the probability of collisions, further fueling the adoption of IoT, subsequently impelling the global railway management system market size. Driven by the railway authorities’ increased focus on facilitating a more enhanced customer experience, railways are also deploying a number of digital technologies and services to provide more value-added services to the passengers. This has indeed propelled the safety, reliability, efficiency and overall performance of the railway services, fueling the railway management system market trends. The Asia Pacific railway management system market is projected to witness exponential growth in the years to come, primarily powered by the surging number of strategic initiatives adopted by regional governments to up the economic ante of the continent. That said, the increasing GDP of the Asian nations and the vast majority of smart city initiatives that typically revolve around the region’s public transportation networks are also expected to boost APAC railway management system industry. According to a 2018 report by The Economic Times, under the Indian Government’s smart city initiative the total amount of investment proposed across 4,500 projects in over 99 cities was approximately INR 203,979 crores with a large chunk of it being utilized in development of smart stations. Attributing to these factors, the APAC railway management system market is anticipated to register a CAGR of 14% over 2018-2024. Driven by the increasing level of competition in the industry coupled with rising passenger expectations, the Passenger Information System (PIS) solution holds the largest growth potential in the global railway management system market. The growth of this segment can also be aptly credited to the high level of urbanization coupled with the increased use of smartphones and rapid evolution of technologies. The popularity PIS components has also triggered a number of partnership agreements in the industry. For instance, back in December 2018 KeTech Systems Limited (KeTech) partnered with Luminator Technology Group (LTG) to develop a real-time enhanced Passenger Information System. As railway systems work on adopting IoT and bringing in an overall digital transformation to the market, system integration & deployment services are expected to garner intense momentum, as railways replace conventional network systems with new & innovative IP-based technologies. 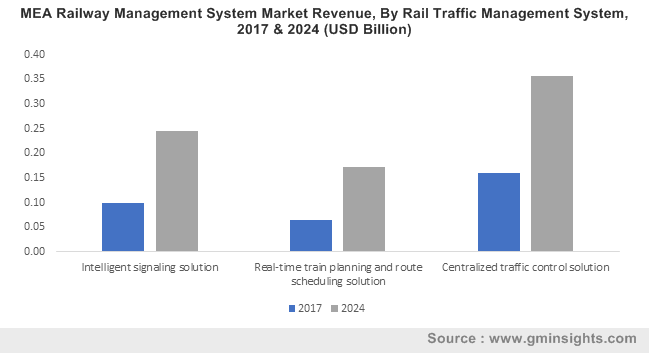 Railway management system market size from system integration and deployment services was pegged at around $1 billion in 2017, and the industry is projected to acquire significant gains from these services in the years to come. The projected growth can be attributed to the fact that rail companies continue to adopt more efficient system integration & deployment services in an effort to successfully integrate their present legacy systems with new, innovative technologies while also rolling-out new systems to create highly-scalable, cost-effective solutions to facilitate an enhanced end-to-end connectivity. The various benefits offered by the cloud would be responsible for enabling railway management system market from the cloud deployment model to register the fastest growth rate over 2018-2024. The model helps rail authorities to perform their operations in a highly efficient & greatly convenient manner as it allows for over-the-air updates, easy remote access through a browser while also being highly scalable & secure. These attributes make the model highly sought after, further augmenting its demands across the global railway management system market. With the rising need to better serve the tech-savvy customers who are demanding for more efficient & easier to access services and the inherent requirement to make the rail authorities’ operations more convenient & less complex, the global railway management system market is projected to record significant gains in the forthcoming years. According to Global Market Insights Inc., the increasing rate of IoT adoption across the global rail industry is projected to impel the remuneration scale of railway management system market, slated to cross a valuation of $64 billion by 2024. This entry was posted in Automotive & Transportation and tagged Centralized Traffic Control Solution, Communication-based Train Control Solution, Facility Management Solution, Global Railway Management System Market, Integrated Control System, Intelligent Signaling Solution, Passenger Information System, Positive Train Control Solution, Predictive Analytics For Maintenance Management Solution, Rail Asset Management System, Rail Automation Management Solution, Rail Control System, Rail Maintenance Management System, Rail Operation Management System, Rail Security, Rail Traffic Management System, Railway Management System Market, Railway Management System Market Size, Real-Time Train Planning And Route Scheduling Solution, Revenue Management Solution, Ticketing Management Solution, Track Monitoring Solution, Train Information Solution, Vehicle Maintenance Scheduling Solution, Workforce Management Solution.